Some of the really excellent death doom bands could be found in Holland, names like Celestial Season, Orphanage, Officium Triste, The Gathering, and the likes have; in certain points of their careers, released such unforgettable opus to a genre that is bludgeoned with sadness and desperation. 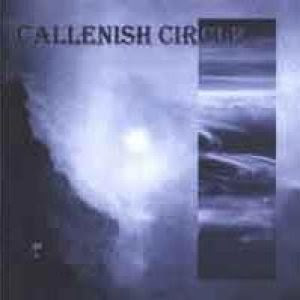 Callenish Circle, especially during their demo and 1st album period, delivers just the right death-dooming splendour manufactured proudly in Holland. Years after they’ve evolved to be more of a melodic death Metal bands, that doomy approaches are being left further behind. Calling it quit in 2007, those doomish years are what to be the most memorable ones in my Callenish Circle-experiences. Interview with Patrick Savelkoul, the vocalist. Well, Callenish Circle was formed back in 1992 under our former monicker Genocide. In the beginning of 1994 we got a steady line-up and we planned to record a demo-tape in 1995. 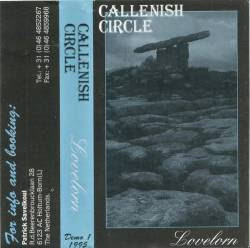 Finally in May 1995 we entered the Beaufort Studio to record our debut-tape entitled “Lovelorn”. This demo got a really overwhelming response from the underground scene. It was voted to be best ‘Demo of the Month” in Dutch major magazine Aardschock and it even reached a 3rd position in Aardschock’s yearcharts. Furthermore established magazines like Rockhard, Mindview, Grindzone, Metallian and Decibel Storm were really positive about the first effort. Besides Callenish Circle appeared in on tons of compilation-tapes and on two compilation cds. With the demo Callenish Circle already got a settled name in the international underground scene. With the success of the “Lovelorn” demo also record companies started showing interest and finally in January 1996 we decided to sign with the Dutch Metal label HAMMERHEART RECORDS for the release of one album. In April 1996 we entered the Beaufort studio again where we recorded our debut album “Drift of Empathy” under supervision of wellknown producer Hans Swagerman sr. (who is known for his work with a lot of Dutch bands like The Gathering “Always” and Phlebotomized). The “Drift of Empathy” CD contains nine tracks with a playing time of 50 minutes. Let’s talk about your demo first. What’s your opinion about it? I noticed that the lyrics dealt with personal emotions or something like that, am I right? And the song “Lovelorn”, is it dedicated to someone? Any specialities of this song as it is also the title of the demo? Well we are still very satisfied with our “Lovelorn” demo. The sound is good and it also has a very professional inlay. Besides the tape got some really good response from the scene and that’s what counts. Yes, the lyrics of our songs deal mostly about human emotions like sadness, psychotic problems and subjects like that. No, the song “Lovelorn” isn’t dedicated to a particular person like most of our lyrics don’t reflect reality. The lyrics are just topic we like to talk about, no more and no less. Now that you have released your first CD “Drift of Empathy”; so what differentiate this CD from the demo? The sound of the CD is better. Talking about the new material… I think the new songs are more well thought and maybe a little bit more technical, but the music is still in the same direction as the demo tracks. We like to describe our music as ‘various and melodic death/thrash with a doomy touch’. You recorded both your demo and CD at Beaufort Studio. Why did you choose this studio and also Hans Swagerman as the producer? We were very satisfied with the sound of our “Lovelorn” demo that’s why we decided to return to the Beaufort studio. Before we recorded the demo we checked out the sound of several studios and we thought that Beaufort studio was the best option for our music. The CD was released on HAMMERHEART RECORDS. What made you chose this label and how’s the deal? You must know we didn’t send the demo to labels for a deal. We released the demo to spread our name and to see how the scene reacted towards our music. But we did sent the demo to some labels/distros for a possible distribution and that’s how HAMMERHEART RECORDS got interested. We talked a few times with them and finally we decided to sign with them for one CD. There was some interest from other labels but that didn’t become really concrete and that’s why we chose to sign with HAMMERHEART. You’re using piano on “Slough of Despond”. Is additional instruments play a big part in Callenish Circle’s songs? Don’t you think that by adding a lot of additional instruments might loosening the aggression of what is classified as “Metal” music? No, not really because we ain’t having a permanent keyboard player in our band. Right now we are looking for a permanent keyboard player but they are very hard to find in our area so probably we will stay as a 5-piece in the future. On the CD we have a few little keyboard parts but it’s mostly additional and on the background so we still are able to play these songs live without losing the identity of the songs. I think you should try to find a good balance between the raw and aggressive side of Metal music and the additional instruments on the other side if you want to use them more frequently. In Callenish Circle we only use some keyboard parts when we think it can add something to parts in our songs and not because we want to have keys in our music, so we use keyboard only in a functional way and not as a priority instrument if you understand what I mean. Besides we compose our songs only with drums, guitars and bass so you can say Callenish Circle is a guitar-orientated band. Your demo received quite a good response in the worldwide underground scene. Did you expect this, and what how do you feel about this? No, not at all… when we planned to record the demo we only wanted to spread our name and to see how people reacted towards our music. So we certainly didn’t expect this huge response… of course we are very thankful to all these people who have helped us so far by supporting Callenish Circle. I hope we will always be able to give them even better music in return in future times. So thanks to you all, you know who you are!!! What do you play your music for? Are you playing for your self-satisfaction or just to attract listeners ? Do you take your music as your way to earn a living? There are two reasons why I play in Callenish Circle. The first reason is because I like this kind of music and I also listen to it at home. You see; what can be more fun than playing the music you also like to listen to at home. The second reason is to attract listeners and to get the recognition for what you are working for. I mean it really gives a kick when people in, let’s say Malaysia like your music or when you are featured in magazines with interviews or good reviews. With this you won’t forget why you are spending so much time in the band. Lots of bands are singing in their native language right now. Ever thought of doing so? Yes, I also noticed that more and more bands are singing in their own language. Right now I don’t feel much for doing this. I don’t know why, it just doesn’t attract me but maybe in the future we will create a song in our own language… who knows??? What do you think about the development in the Metal scene nowadays. I mean lots of bands are trying to make their own sound. Does Callenish Circle belongs to this ‘circle’ or staying intact to the ‘originators’? I’m aware that Callenish Circle isn’t playing 100% original music. You see we like to describe our music as various and melodic death/thrash with a doomy touch and all the elements in this description are already existing. But of course we are trying to create our own sound and not to copy other bands. You see we are constantly trying to develop our music in a way that people will recognize it’s Callenish Circle when they hear our music. We are trying to create a very own identity for Callenish Circle but to reach this goal for 100% it takes a long time I guess but we are working on it very hard!! I wonder why Callenish Circle is very fond of the colour blue. Any special reason(s)? No! We just like this colour and we think it fits good to the music we play. It’s a mystical colour like the colour red can be referred to aggression. The inlay of our demo was in blue and also our flyers are printed in blue. The colour of our album is a combination of the colours purple and blue… I think we just like it this way. What about the Holland scene right now. Isn’t it too over-crowded with lots of doom-orientated bands. You are right that the Dutch scene contains a lot of bands but I don’t agree with you that they are all playing in the same doom/death Metal style. We have a lot of talented bands and their style are really varied. For example bands like Sinister, Nembrionic, Consolation and Altar are playing really brutal death/grind. Bands like Orphanage, Celestial Season, Phlebotomized and some more have doom influences and bands like Threnody, Polluted Inheritance and Creepmime are playing progressive death Metal. But I think they all sound really different from each other although they might play in the same overall style. So I think most of the Dutch bands try to create their own sound. But there is one strange thing in the Dutch scene. Now in a time when black Metal really dominates the scene there are almost no black Metal bands around that are worth mentioning, only Liar of Golgotha and Countess are bands that people might have heard about. I think this is on the one side really strange but on the other side it proves that the Dutch musicians aren’t blind trend followers. That deserves also some respect I think. I noticed that most demo-tapes from your country comes in a really nice packaging and excellent sound quality. Is the costs really cheap there or is there any other reasons? No, it’s not really cheap to produce a professional demo tape here. I think it’s even more expensive compared to other countries. I don’t know why most of the bands want to release their demo in a professional way. Maybe because the scene in Holland already exists for a long time and it contains a lot of bands. So when there are a lot of bands in such a small country you should try to your very best concerning your product otherwise people won’t be interested as there are many more bands with quality demos to choose from. OK, is there any new bands that you think stands apart from the others? What is your current playlist for the time being? I always discover new bands that attract my attention and I think Sirrah (Poland) is really an excellent newcomer. I already know them from the time they had their “Acme” album out on cassette only. MUSIC FOR NATION now signed the band and re-released that album on CD. I hope they will be able to release another great CD like “Acme” and they will develop more and more. Maybe the new stars in the future…??? Also Endless (Czech) is a really promising band. They are only in their demo-period but when I had a label I would sign them immediately cause they really are able to create very good music. Of course there are more bands that are promising and also here in Holland but these two are my favourites at this time! Do you know something about the Metal scene here in Malaysia? No, unfortunately I haven’t heard bands from Malaysia that kept in my mind but I am in contact with some magazine-editors from your country. We really often receive mails from your country and that’s cool!!! Before we end this interview, what can we expect of Callenish Circle in the near future and any last words for the readers? Right now we are working on new materials for future releases. But don’t expect a new release very soon as we wil take all the time needed to compose the new songs and be sure they will be killing. The new material will be more melodic and most important of all more wellthought than the songs we wrote before. Besides we try to play as many live-gigs as possible to promote the album in a proper way… To the readers I would like to say check out our music. Thanks for reading this and take care!